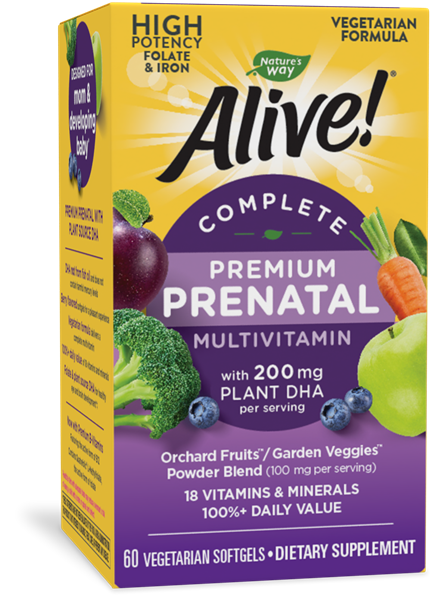 Alive!® Complete Premium Prenatal Multi - Nature's Way®. Each daily dose delivers 100%+ daily value of 18 vitamins and minerals, as well as 800mcg of folic acid and 200mg of plant-source DHA. For women that are pregnant, nursing or trying to conceive, take 2 softgels daily. Do not chew. If taking any medications, consult a healthcare professional before use. life'sDHA® is a trademark of DSM.